This page integrates daily GPS measurements from ~1500 stations along the Pacific/North American plate boundary, ranging from Alaska to the U.S-Mexico border (click on figure to right). Cleaned, network solutions from several arrays are merged below and grouped into regional clusters. 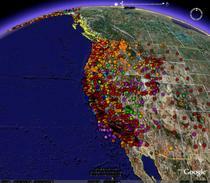 Arrays include the Pacific Northwest Geodetic Array, EarthScope's Plate Boundary Observatory, the Western Canadian Deformation Array, and networks run by the US Geological Survey. Map images below link to station locations. Data image thumbnails update daily, and link to positions updated daily. 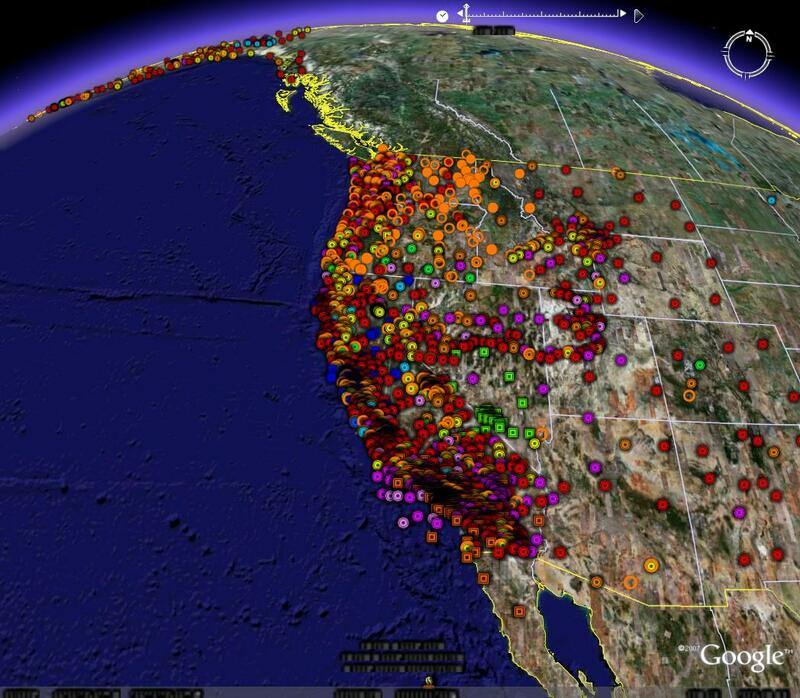 Time series from the Plate Boundary Observatory network are merged GAMIT and GIPSY solutions from UNAVCO, Inc., while PANGA stations from Washington, Oregon and northernmost California are GIPSY-only solutions computed by the CWU Geodesy Lab with support from the USGS, NASA, and the National Science Foundation. All CWU time series & all PBO data can be downloaded. The data grouped into clusters around Cascadia volcanoes are rotated into cylindrical coordinates centered on the specified volcanic edifice. Motions are labeled "Away" (radially from the volcanic center, with outward motions positive) and "Tangential" (with counter-clockwise motions positive).